Until 1771, the North Gate spanned Cornmarket immediately to the north of St Michael’s Street and St Michael-at-the-Northgate Church. Hence Cornmarket was known as North Gate Street until 1536, when a covered area was erected there to facilitate the selling of corn. 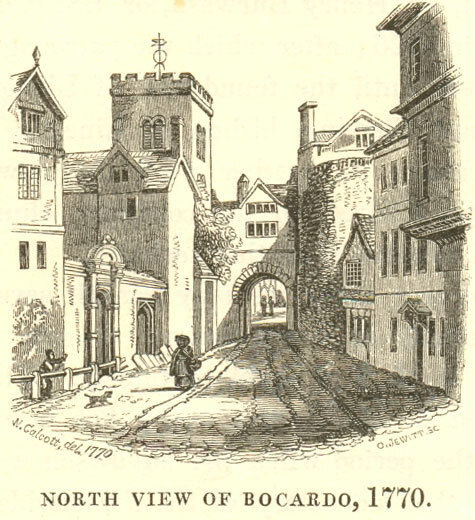 The above engraving shows the North Gate (and the Bocardo Prison, part of which was on top of the gate) looking from outside the city wall to the north in 1770. A view from the opposite side, looking from the south, can be seen here. This was the strongest gate of the city; as indeed by good reason it should, having no river before it, as the other hath. It was well strengthened on each side with a strong, bulky tower; and backt on with another gate, both formerly well fenced with a port-close or port-cullis to let downe before; as alsoe a military engine erected over it, through which they could cast downe anything obnoxious to the enemy approaching therunto. 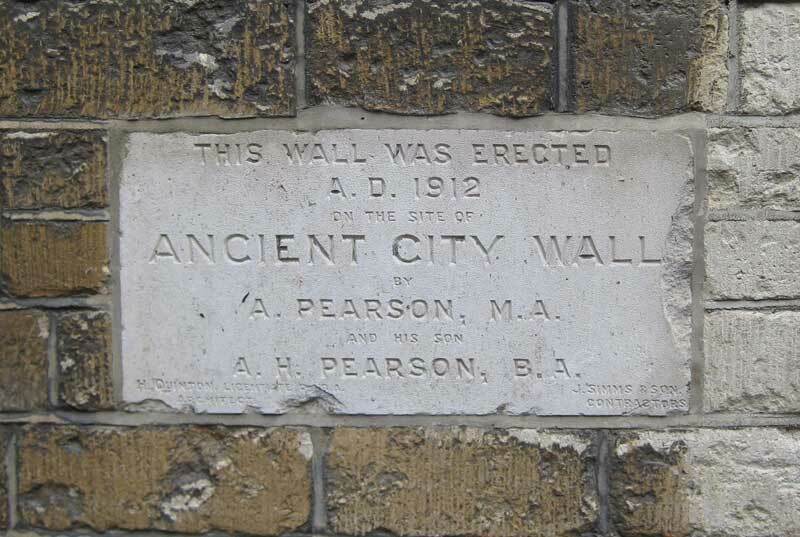 Such a gate soe strengthened was called “porta macho-collata”, which was a passage over it like to a grate through which scalding water or any other weighty substance may be cast uppon the assailliants. Beside this there were two great folding dores hung thereon, made strong with barres of iron nailed upon them; as alsoe a massie chaine that crossed the outward gate. By which we cannot otherwise imagine its pristine beauty and strength, not only for fortifications, but for battlements, statues and armes theron; which afforded great delight to strangers that cam that way. And soe without doubt it might have continued, but, the Barons’ Warrs ceasing, halcion days appeared and our swords became rustie; and this place, for want of use, fell into the hands of the Mayor and bailives, who afterwards made it a common prison for debters and malefactors belonging to their owne city, which for the same use continueth to this day; and a prison for scollers for little faults…. Now whether or noe “Bochord” or “Bocordo” were put to such uses as a library and place for sale of books when our University was in Bellositum, i.e., now Bewmont [Beaumont Palace), to which they joyne close to each other, which was before this gate was built or any thoroughfare there; I shall leave it to your sower criticks in antiquityes to chew upon…. The Oxford martyrs Cranmer, Ridley, and Latimer were all confined in the Bocardo Prison in 1555. To take down the North Gate, and so much of the Prison called Bocardo, and such Houses and other Buildings on both Sides of the said Street, near Saint Michael’s Church, and purchase such Ground as shall be necessary to widen the said Street. The North Gate was duly pulled down in 1771.